PILLOW- (throw pillow) small pillow for decoration: a small decorative pillow placed on a couch or an armchair. 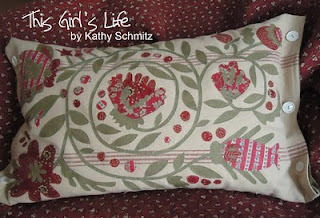 Welcome to the Moda Pillow Talk Blog Hop! Each of the designers were challenged (by me) to make a pillow that describes them. It could be their design process, their history of textiles or just as simple as something that makes them happy. The definition above for talk seemed fitting since I did pressure them to talk about themselves and stand up in front of people. The pressure has continued because now I have asked them some intriguing questions. They will be revealing some answers during their “Pillow Talk”. I promise nothing to risque. Oops, I can’t promise anything with this bunch of gals except that you will WANT to follow along. 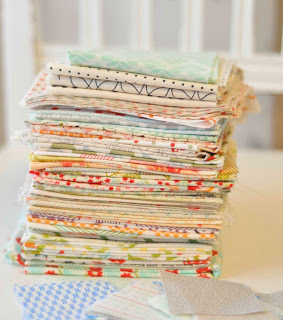 Just one of the questions the moda designers will be answering during the blog hop…..
Aneela Hoey started the hop from all the way over in the UK on Feb. 1st. Feb 2. The charming ladies from Blackbird Designs. 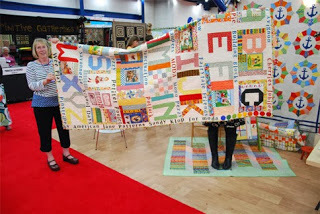 Feb 5th Cotton Way will be featuring some of her wonderful projects as well as nightime fashion. Feb 13th Liesl from Oliver+s is our own little superstar. Academy Awards may have to be cancelled because eveyone will be reading Liesl’s blog instead. Feb 14th Sandy Gervais, the queen of hearts, is featured today. Sandy is doing a painting a day to celebrate the blog hop. See the end of this post for a few surprises. Feb 15th Lauren and Jessi Jung , just one of our mother and daughter teams. SURPRISE #1 Feb21st- We have an angel joining us. 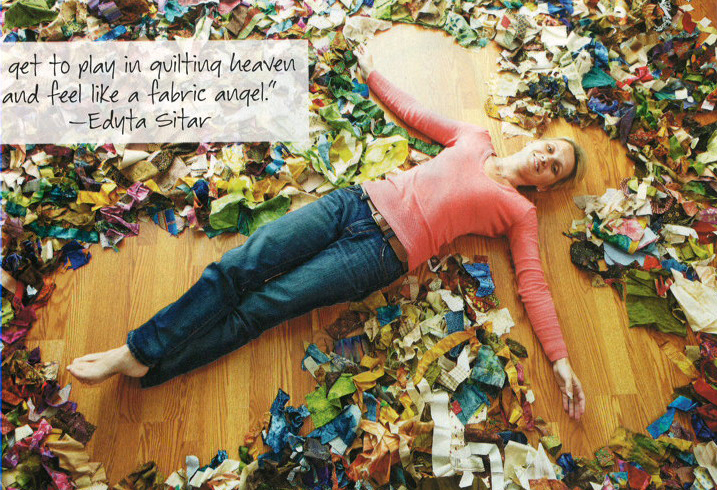 Edyta Sitar has joined the blog world just in time to finish up the Blog Hop. CHECK OUT HER BLOG, Click here. SURPRISE #2 Feb 22nd- AND ONE LAST STOP- Back here. I will have a trivia game right here with some pillow talk questions. Whoever answers correctly to the questions will be entered in a drawing for a PRIZE from me! I am actually hoping Sandy Gervais paints me a picture. Do you think if we kept adding to the pillow post that Sandy would keep painting her adorable pictures? Moda Fabrics is one of the sponsors of The Creative Connection happening next week in Minneapolis, Minnesota. 3 of the moda designers will be there teaching classes. 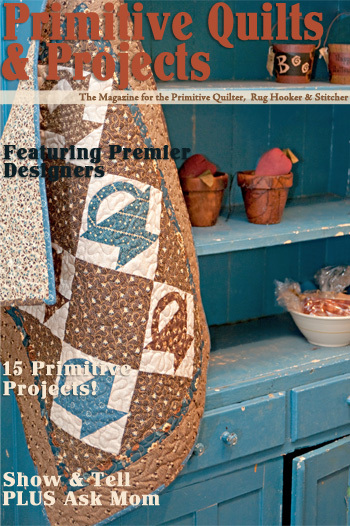 Camille Roskelley from Thimbleblossoms will be teaching A Retro Kitchen. Do you think she would mind if I call her Baby Mama during her class? Joanna Figueroa from Fig Tree & Co will be teaching Sugar Pumpkin or Owl Scarflette. Wait there is more….. Karri Meng from French General will be teaching a jewelry class. I have the very daunting task of going to this event. Some one had to do it so I do not mind taking one for the team. I am just that kind of gal. Wait until you see how great the goody bags are. Kuddos to the entire team for putting on such a great event for women. To see the complete list of teachers that will be there, click here. All the greatness from so many different industries will be the coolest thing ever. Names like Amy Butler, Jo Packham, MaryJane Butters, Nancy Soriano and of course the pioneer woman herself, Ree Drummond. If you can get there, please do. If you are coming, I hope to meet you. I will be earning my keep by helping in any way I can. I told them to put me to work taking tickets or something. instruction’s HERE. It did make me start thinking about what if? What if the next big Hollywood blockbuster was EAT, SLEEP, SEW? Who would play the Julie Roberts role? Heidi Klum could star. She certainly could fit it in after Project Runway. Maybe one of the REAL housewives from New Jersey? A reality show of quilters? 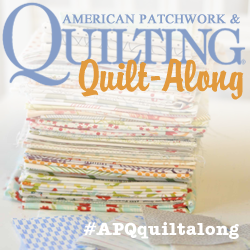 How about a bunch of quilters in the same room with only 1 spool of thread? They could have cat fights over jelly rolls? I am so sorry, I must have dozed off into some crazed dream. Market is coming is my only excuse. Back on topic! I just love love love this tin. 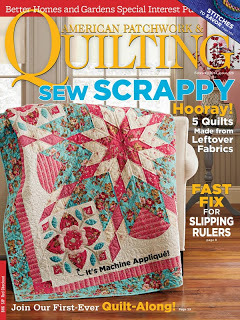 What quilter, sewer, crafter wouldn’t? Using Laurie’s instructions I made my own version in 15 minutes. I then gathered all my hexagon’s and supplies and proudly put them in my new organizational tin. I also added a magnetic strip to the inside which will come in handy. How would you “Bling” a sewing tin? What would you add? What notion can you not live without? 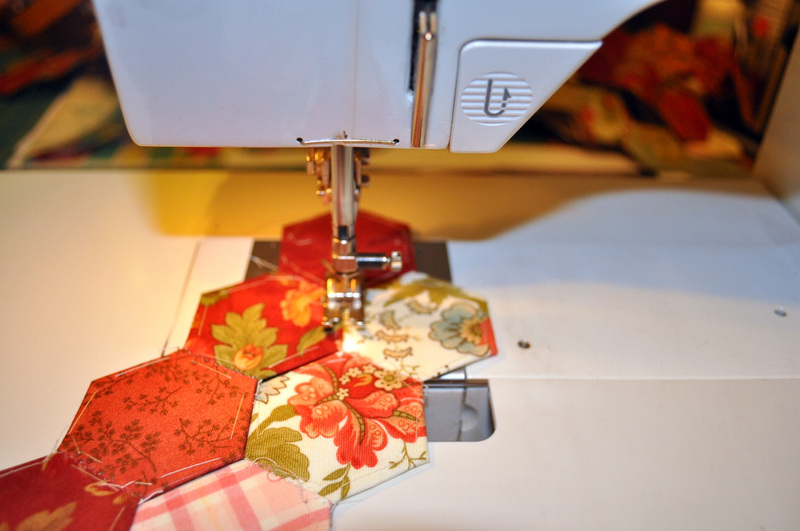 You may remember my blog post about hexagons. I blogged about them HERE. I was sewing them together by machine because I thought I would be bored doing so much handwork. I quickly had all my hex’s sewn together and had to make more. 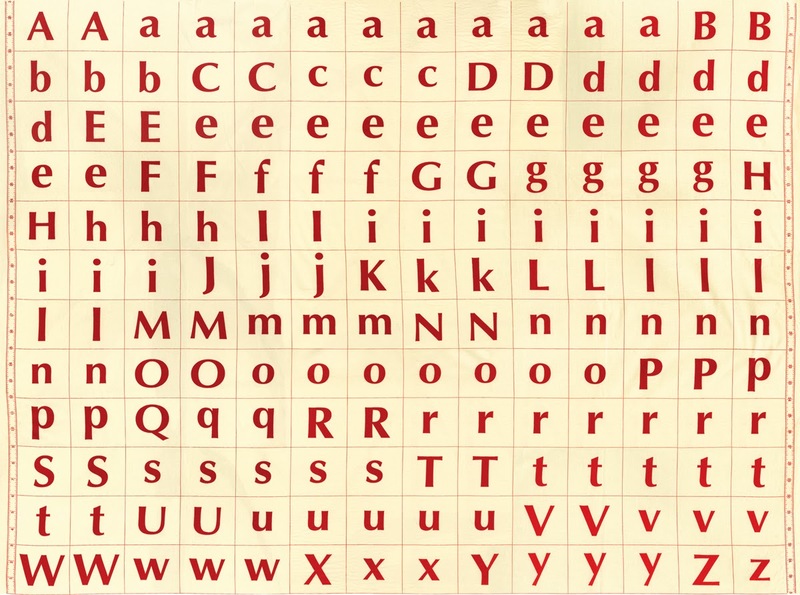 Then, I got stumped when it came time to turn the corner and actually had to create the horizontal and vertical rows. The rows would not meet until….. This is how to make a half hexagon. Sew 2 fabrics together. Press open the seams and trim away excess bulk in the seam allowances. Lay the paper hexagon making sure to line up the seam with the point of the hexagon. I show you this for a couple of reasons. I am getting closer to finishing my borders. I just have to make about 300 half hexs. 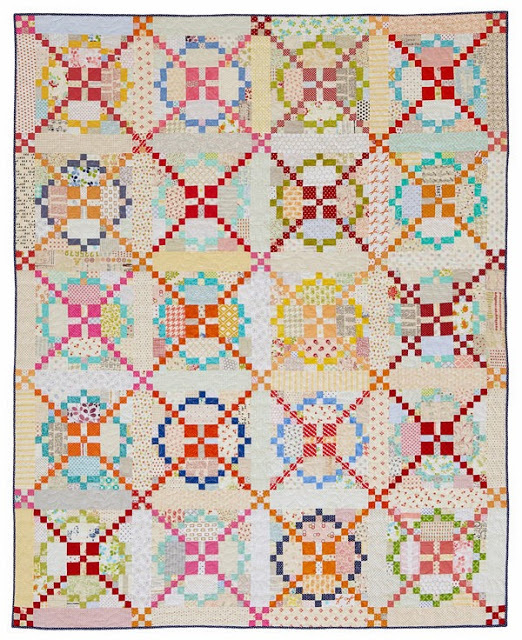 I am so inspired by all the hexagon bloggers out there that I am dying to start another colorway. 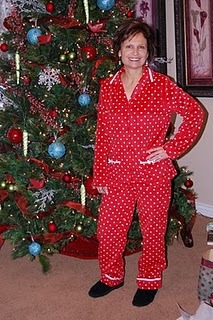 I am dying to make some of these from Sew Mama Sew. You could make a charm hexagon quilt where no two fabrics are the same. Read about it HERE. I use English Paper Pieces for my hexagons. They have all kinds of info on their website. Paper Pieces are available at all the quilt stores. 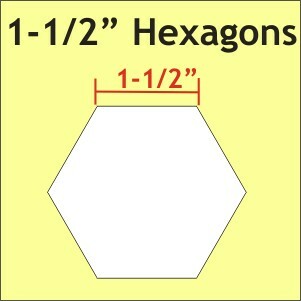 Remember when buying the size you want to measure 1 side of the hexagon to determine the size. 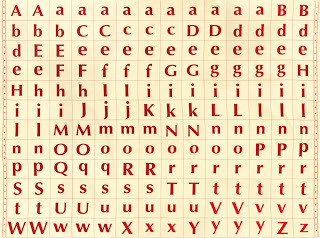 They range in size from 1/4″ papers to 3″ papers. You can cut a moda charm pack into 4ths and have tons of fabric ready to baste in place. I am obsessed by all the possibilities of such a simple shape. I would like to give Laurie credit because now I have a new tin to fill full of hexagons. 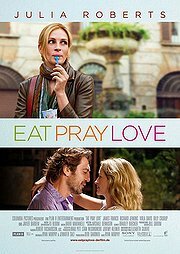 Maybe I will rent Eat, Pray & Love when it comes out on DVD, invite Laurie over and sit and make hexagons! Let me know if you are hexagon-ing?